In his first effort, actor, co-writer and director, Orson Welles, made this incredible drama, which many film critics and fans consider the best American film ever. 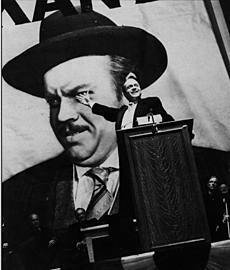 Welles received a nomination for best directing. The cast includes: Welles, Joseph Cotten, Everett Sloane, Agnes Moorehead, Ray Collins, Paul Stewart, Ruth Warwick and Erskine Sanford, Dorothy Comingore, and George Coulouris.